# 2F22 - This filter package will fit the Cheetah II or the Cougar Ash Vacuum The filter package comes with two filters: Outer and Inner filters. Outer Filter: Made of a flame resistant fiberglass material. If any hot ash get sucked into the vacuum, the fiberglass filter will not start on fire. 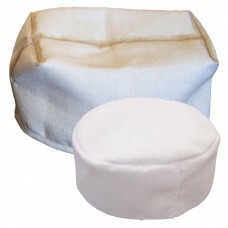 Inner filter: Made from a high quality material that will filter even the finest of ash. Without any ash passing the motors means a longer life on the vacuum. These filters will typically last for many years depending on the use but it is a good idea to have a filter package on hand in case for replacement purposes. Many times people think their home is all dusty because their stoves are not leak proof but in actuality it is the way you clean your fireplace.